Guns: Gotta Have ‘Em or Gotta Go? Imagine you’re back in high school. You’re walking through the halls, talking to your friends, maybe even flirting with your crush. You feel safe and secure. But what if there were guns dispersed throughout the school? No, not just the school resource officer’s gun, but your teacher’s guns. Would you still feel safe? No? Or maybe, you’d feel safer? These are the questions currently on the mind of every American. This country’s troubles with gun violence—particularly in schools—are nothing new, but the controversial topic is heating up again in the wake of the Feb. 14 high school shooting which left 17 people dead in Parkland, Fla. As always, there is the push for legislation to prevent the next mass shooting. But citizens and politicians alike cannot seem to agree on what that legislation should be. Much of the dialogue surrounds tighter gun control—implementing background checks, which focus on mental health and raising the legal age to purchase a gun from 18 to 21; however, one idea stands out. Although it is essentially the opposite of gun control, the idea of arming school teachers with guns has become a huge topic of debate throughout the country. President Trump has a lot to say about the issue on Twitter. In a string of tweets published Feb. 22, Trump said a school without a gun is a “magnet for bad people,” and showed support for the idea of arming teachers. “(Teachers) would now be able to immediately fire back if a savage sicko came to a school with bad intentions,” Trump tweeted. Those in favor of arming teachers argue two main points. First, it is speculated that knowing teachers have guns in the classroom will deter potential shooters. Second, it is speculated that if a shooting were to occur anyways, armed teachers would be able to stop the shooter instead of waiting for several minutes for first responders to arrive on the scene. 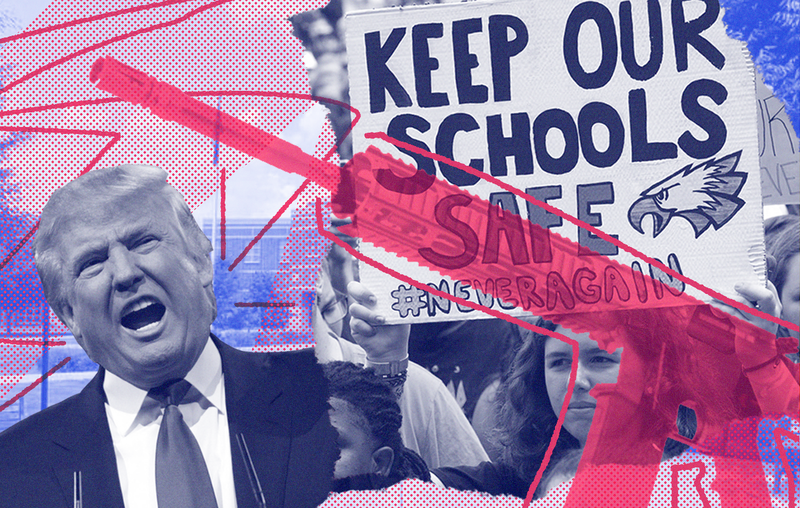 “For us who believe that some teachers should be able to carry (guns), it is because schools are obviously and sadly highly targeted areas,” says Nick Dejanovic, a criminology and justice studies student. It’s true; the first minutes in these situations are crucial. In 2014, the FBI released a study of active shooter situations between 2000 and 2013. They assessed 160 shootings; there were 64 which the FBI had information on the duration of time the shooting lasted. Of these 64, 69 percent ended in five minutes or less, while 36 percent ended in two minutes or less. With these incidents occurring in such a short amount of time some people see the appeal of having employees at the school who is armed and ready. But is this a job for teachers? Special education student Beth Hittie doesn’t think so. Hittie says although she does not see this going through and passing as law, she has concern for what could happen if it does. She fears if a shooting were to happen, the shooter would somehow get ahold of the gun in the classroom. People across the country are calling out the school resource officer outside of Marjory Stoneman Douglas High School, where the Parkland shooting occurred, as an example of how arming teachers will do little to stop the problem and save lives. Deputy Scot Peterson had a gun, but waited outside of the school for four of the six minutes the shooting lasted, according to Broward County Sheriff Scott Israel. Peterson was suspended after Israel reviewed footage of the incident. Peterson later resigned. Although Peterson was not a teacher, the case brings into question the argument that teachers with guns could stop a shooter. With so many clashing ideas, it’s hard to tell where this debate will lead, and what policies—if any—lawmakers will enact. It seems the only thing that’s certain is this topic cannot and will not just fade away, as the survivors of the Parkland shooting continue their quest to make their tragedy the last school shooting.